Breastmilk cooler is ideal for Moms on the go to keep breastmilk and formula chilled for hours. This bag is designed to hold four 5oz breastmilk bottle. Say goodbye to heavy, bulky ice packs that take up space. Breastmilk cooler features its built in freezable gels in all 4 sides of the walls, the base, and top of the bag, as well as a center partition to help separate your pump and breastmilk. Center partition is also made with Packit's patent freezable gels to give this bag an 360 cooling effect. Center partition can be flatten to store more bottles or bags of breastmilk. Compact, so that it does not take up too much space, flattens to the size of a magazine. 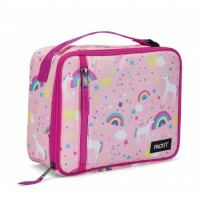 Packit Lunchbox Bag is great for packing fresh, healthy food to bring along for work or school. It's..